Final report from SSAC’s Lives of Substance project now available. Drug use and addiction receive an enormous amount of media attention but most coverage tends to focus on extreme circumstances or is guided by common fears and misconceptions about people who use drugs, and addiction. This report offers important new insights into the many ways people live with drug dependence, how they cope and even thrive, and the challenges they face, including stigma and misunderstanding. Based on a large-scale qualitative research project, the report finds that, contrary to commonly held stereotypes, people who see themselves as affected by addiction are extremely diverse and their individual circumstances and experiences of consumption are equally varied. Importantly, many cope and lead rich, full lives, regulating their consumption, actively managing the risks of heavy use and looking after their health. Some also explain that, for them, regular consumption can be a way of supporting health as much as impeding it. A key concern for many is coping with addiction-related stigma in the context of family and friends, the workplace, the healthcare system, the media and the criminal justice system. For many, the stigma of drug use is as harmful as, or more harmful than, drug use itself. Media training and standard guidelines on how to report sensitively and in an informed way on drug use and addiction issues. The project on which the report was based also produced a ground-breaking public website, Livesofsubstance.org. Intended to inform health professionals, policymakers, service providers, advocates and consumer groups, the website offers much-needed new insights into the range of experiences that make up life for people who see themselves as affected by addiction issues. 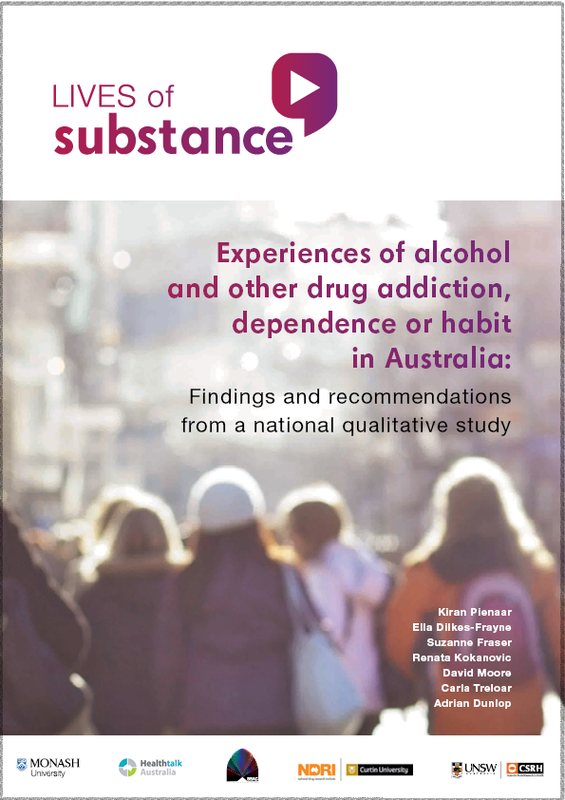 Funded by the Australian Research Council, the project collected in-depth qualitative interviews with 60 people who described themselves as having an alcohol or other drug addiction, dependence or habit. Participants were screened to include only those who would receive a diagnosis of substance use disorder or dependence syndrome using the Diagnostic and Statistical Manual of Mental Disorders (DSM-5) or the International Classification of Diseases (ICD-10) criteria. The research presented in the report was undertaken by researchers from Curtin University’s National Drug Research Institute in collaboration with Healthtalk Australia, Monash University, the University of New South Wales’ Centre for Social Research in Health and the Hunter New England Local Health District.